Like everything in the world, there’s considerable variability in productivity from writer to writer. Some writers are notoriously slow, whereas others seem to have a steady stream of novels, short stories, poems, articles, graphic novels, blog post, etc. flying off their fingers. Folks like Jay Lake, Kevin J. Anderson, Dean Wesley Smith (to name only three writers whose sites I’ve recently visited) are extremely prolific spec-fic writers. I find their productivity stunning. I realize I hold down a day job and have limited hours in which to write—about one to two hours a day—but even if I wrote eight or ten hours a day, I would be hard pressed to get that level of production. No matter how much I’d like to be, I’m simply not a “one-draft” writer, which slows things down considerably. Maybe this will change as I write more, but that’s part of my current reality. When I set my writing goals this year, I chose a fairly low target for number of submittable stories because I wanted something achievable, especially considering my story-writing production in past years has always been low. I set a modest target of ten finished short stories and one novel. I’ve nearly reached my short story target with several months to go. Next year I think I’ll set a target that will challenge my productivity. 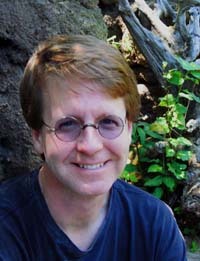 Dean Wesley Smith is trying to write 100 short stories this year (his 100-story challenge), over and above whatever his novel target might be. I can’t match that, but I think I could go for my own 25-story challenge next year—that’s a story every two weeks. Given my day job, and the fact that I’m a “two-or-three-draft” writer, I’m not sure I can write 25 solid, submittable stories in a year. Yet like anything else, you don’t know what you can do until you try. That said, the caveat I need to remember: quality is more important than quantity. Getting stories published (=sold) is the goal, so turning out a few quality stories will likely be more successful than churning out a lot of trash. I wonder if I can do it? I guess that’s why it’s called a challenge. I wish I was a two-or-three-draft writer, Thomas. Everything I do goes through 5-13 drafts, polish and polish and polish and polish…that’s what takes up a lot of time. Wow, 5-13 drafts! You must have fast-typing fingers to get your production while working through that many drafts. If the story hasn’t shown enough promise with the first draft, I usually set it aside and move on to something else. To avoid a lot of false starts, I do a great deal of upfront “mental” planning (I can’t write at teh day job, but I can think about it). Hopefully as I get better at writing, I’ll get more productive at the same time. Thanks for stopping by, Kevin. I’ve only read a few of your things, but I’m looking forward to reading more in future—there’s certainly an impressive amount to choose from.